2018 Business Holiday Lights Contest - Register Now! This annual tradition returns! Decorate your business by Monday, December 10, 2018 for a chance to win cash prizes and bragging rights! Be chosen as the Best Business with Holiday Lights! Judging is based on design, creativity, festive appearance, and overall visual impact. Pre-register by using the form below. We hope to see you shine your holiday spirit this season! 2017 Holiday Lights Contest Winners! Thank you to all the businesses that entered the Delhi Holiday Lights Contest 2017 business category and helped light up the holidays for our community! Click here to find out who won in the residential category. Business Holiday Lights Contest - Register Now! This new annual tradition returns! Decorate your business by December 19, 2017 for a chance to win cash prizes and bragging rights! Be chosen as the Best Business with Holiday Lights! If you have any specific details that we may need to know, please add here. Thank you! Click the button below for a constantly updating list of holiday events this season in the Greater Delhi area! Shopping, parades, living nativity, and more! The tradition returns! Decorate your home by December 17th for a chance to win cash prizes and bragging rights! Are you the winner of Best Holiday Lights 2017? The contest is open to all residents of the Delaware Academy School District. Judging will take place on December 18th, 19th and 20th. Special recognition "Most Festive Street in the Village of Delhi. Nominate your neighbor! Pre-register and get judging criteria by calling Peg Baldwin at 607-746-3355, or send an email to or mlbaldwin2@yahoo.com. Winners will be announced in the County Shopper on the week of December 25th. We hope to see you shine your holiday spirit this season! Small Business Saturday is a movement encouraging people to shop at small local businesses on the Saturday after Thanksgiving. An alternative option to big-box chains and online retail giants, the powerful message of the holiday is to support local entrepreneurs and keep their brick and mortar businesses alive. By doing so, we help energize local economy, keeping it viable and beneficial to all. 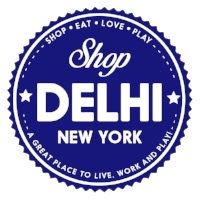 We're so proud of all the unique small businesses here in the Greater Delhi Area. Through their work and efforts, we form our identity and pride. 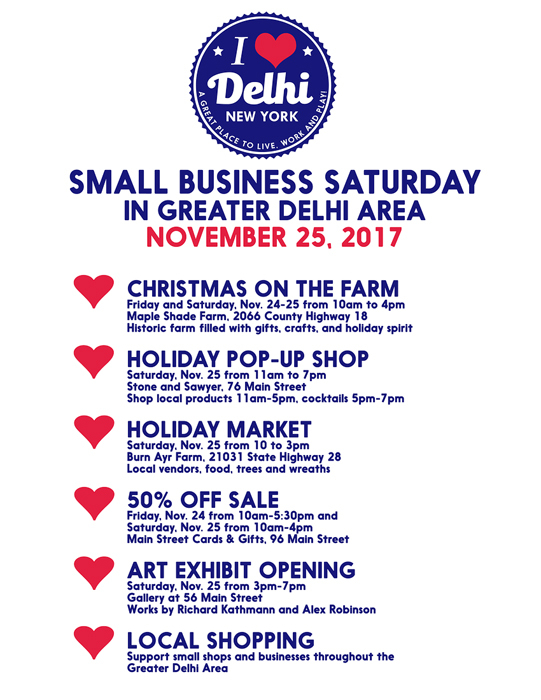 While we strongly suggest that you shop small the entire year, we are putting our best foot forward with on Saturday, November 25th. We welcome you to come to the Greater Delhi Area to shop all day and enjoy the evening events at Stone and Sawyer and the Gallery at 56 Main Street.